Ray Bradbury makes a valid point: if you’re not going to read a book, you may as well burn it. And yet, we should probably realise that this is disingenuous – the Ayatollah Khomeini didn’t burn as many copies of The Satanic Verses as he could simply because he knew he’d never get round to reading it himself. No, if there is a ‘criminal’ element of book burning, it lies in denying a book to other people. It is a crime that has been committed around the world and throughout history with stunning regularity, from the multiple destruction of the libraries at Alexandria, to the raids carried out earlier this year on the manuscripts of Timbuktu. There is no doubting that in all of these incidents, the burning of books was undertaken and encouraged, at least to some extent, in order to prevent a wider population from being influenced by the ideas contained in them. 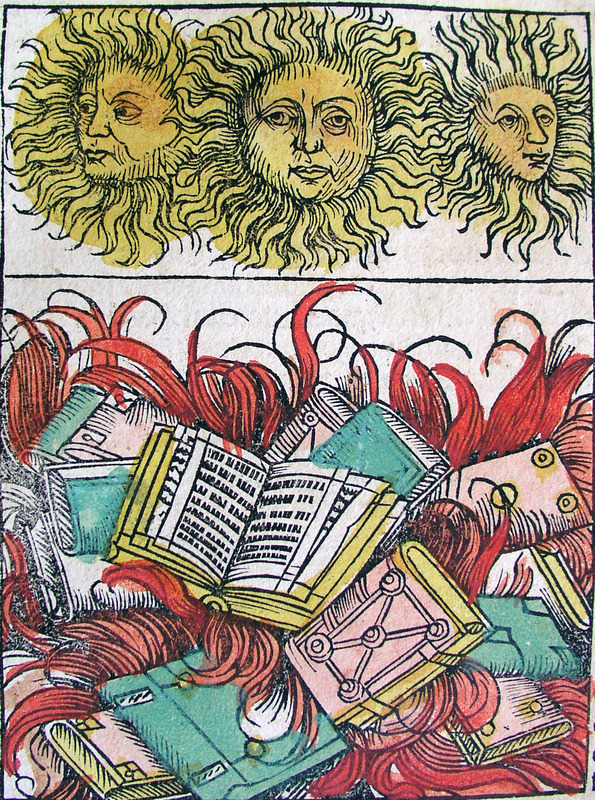 As a result, book burning is a classic sign of despotism, whether religious, political or otherwise. It is strange, therefore, to encounter a head of state bearing all the hallmarks of a dictator who nonetheless champions reading as a virtue to be encouraged. In a speech in 2009, Hugo Chávez told the assembled masses to “read, read, read, read.” This was not, as some may suspect, a cunning exercise in reverse psychology on a national scale, no, Chávez meant it. In fact, he meant it so genuinely that he introduced a “Revolutionary Reading Plan”, with a prescribed reading list containing not just Marx and Lenin, but also Oscar Wilde and Edgar Allen Poe – two writers who almost certainly featured prominently in the Nazi bonfire that was part of the “Action Against the Un-German Spirit”. Furthermore, it is universally recognised that Chávez himself was well read, and in any case he frequently participated in book clubs and writers’ meetings. At first glance, this is difficult to square with the undemocratic style of his leadership, and in particular his repression of freedom of speech in Venezuela. Upon closer inspection of the “Revolutionary Reading Plan”, however, it starts to become clear that this was not an attempt to help people develop their own independence of thought and personal taste. For example, part of the Plan involved sending colour-coordinated book squadrons out onto the streets to “help” people with their choice of literature. Of these, the most feared presumably was the black squadron, assigned to the fourth and final stage in the reader’s education, whose stated purpose was “the sharing of textual tools for cultural resistance against the ideological cultural attacks of the imperialists”. With alarming speed we have descended from the wonderful prose of Don Quixote (Chávez was a big fan), to the clichéd slogans peddled by almost every marxist dictatorship to have graced the planet.